Ornamental garden and woodland set in the wonderful countryside of the Welsh border above Tintern. Anne was described in the Telegraph as one of Britain’s most influential gardeners and is also the editor of thinkingardens, – where really exciting garden writing by the best garden writers can be found. The garden is open in summer to parties and individuals. 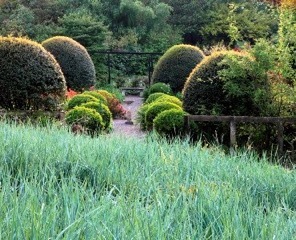 Veddw House Garden is set in the wonderful countryside of the Welsh border above Tintern. There are two acres of ornamental garden and two acres of woodland. A favourite part with visitors and ourselves is the dramatic reflecting pool. The local landscape of rolling hills is reflected in the sinuous hedges that lead to the pool and provide the perfect backdrop for other planting schemes. Anne has a great interest in the history of the local landscape and has incorporated this into the garden design, in particular a large parterre of grasses in a pattern of box hedges based on the local Tithe Map of 1842. 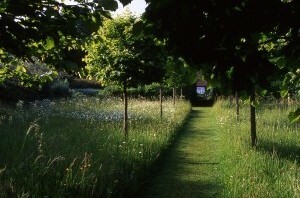 Much of the garden was made on ancient grassland, which has been conserved in many parts of the garden, especially the Meadow. Coach parties and groups of ten or more are welcome by arrangement from May to September (not including August Bank Holiday). More information for visitors can be found at the Veddw House Garden website.